Both me and my Formula E/Opinion writer Jack Amey have bought and reviewed F1 2017, and just for this we now have a YouTube channel for F1 2017 footage (and in the future, maybe more too, who knows?). Both of us have recorded footage, both using a Logitech G29 steering wheel and have a decent gaming PC to run the game on, and no assists, at all. As soon as you load up the game for the first time you’re straight into creating your own driver, with lots of pre-set options of appearance, with a good mix of gender and race. Currently I have only run a few time trial laps, a one shot qualifying session and some short races, but what I have done has been so much better than in previous games. The time trials are a great way to learn the basic feel of the cars and learn your braking points and gears, generally the first thing I do in any racing game, Silverstone always my track of choice as I know it so well. I haven’t played the last few F1 games, so not sure just how much of this is new, but the time trials are ranked globally, with the option of having the next car ahead of you as a ghost driver, and even copy their setup if you want to, very helpful to increase your own skills. Next up I went for a short race weekend to see how I was against the AI, again Silverstone, ran some practice laps with intermediate tyres, no footage of that though as nothing particularly interesting happened. Qualifying was one shot and pouring with rain, first time using the wet tyres, so my lap wasn’t the greatest, but it was so much fun. Finally the race, played around a lot with this and if you’ve been watching the videos you might notice the qualifying position above isn’t the place I started in. The AI was set far too low so after several tweaks and more quick races set up I finally found the level I was liking. Some overly ambitious overtakes were attempted to test the AI and none worked (which is good), and a fantastic fair battle with Hulkenberg for position as well. Overall so far, great fun. My issue with the previous games has always been the difficulty, every single game I’d be too fast for one difficulty and never even needing to push too much and then too slow for the next one. With the AI slider this is no longer an issue and I can tweak it to perfection. If anyone is picking the game up I’d recommend doing a few quick races at a track you’re comfortable at and tweak the AI until it’s just about right. Classic cars also make a welcome return to the franchise, enabling players to drive some legendary cars from the McLaren MP4/4, the Williams FW14b, Michael Schumacher’s title-winning Ferraris in the Ferrari F2002 and F2004 and the car Lewis Hamilton won his first title in, the McLaren MP4-23. It’s a range of cars across the last 30 years or so that means players can drive the best-known cars from different eras. Also new for this year are four new alternative circuits: Bahrain Short, Britain Short, Japan Short and USA Short. These are mostly used for classic invitational events, but you can drive 2017 cars on them should you wish. And perhaps the most stunning new feature, in terms of looks, is the introduction of driving Monaco at night. It’s a scene we’ve never seen before, but it looks great. Career mode is back but developed even further in this year’s edition. Research and development in career mode went from 25 parts with one path per ‘area’ of development (aerodynamics and power unit, for example, with five ‘areas’ in total) and developed that into 100+ upgrade areas, with different paths available. Upgrades can fail, too, meaning you have to spend longer developing them. In my career mode, for example, I wanted to upgrade my power unit (I’m driving a McLaren-Honda). The upgrade was due at Bahrain but when I got to round three, I was told it failed. There’s also the chance to upgrade areas within the team itself. To ‘finance’ the upgrades, you earn research points from practice, qualifying and races. The main way to earn research points is to complete practice programmes. Introduced in 2016, it’s been expanded on again with two new programmes: fuel saving and race strategy. The latter of the two new programmes is vital to get the right strategy for the race. 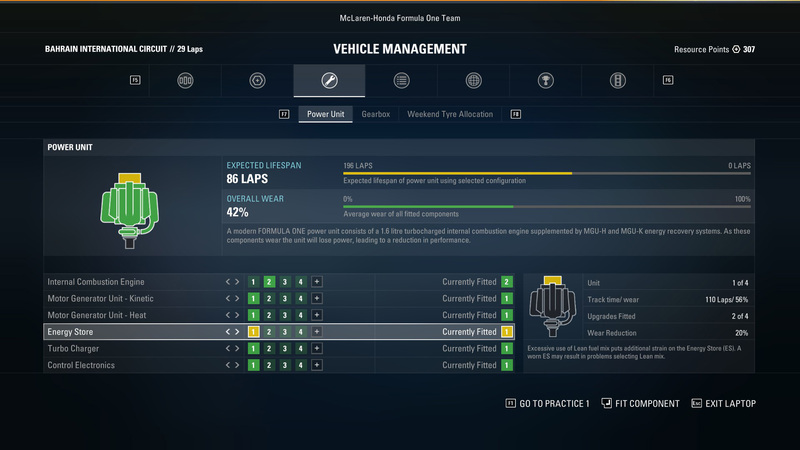 As you can see from the above screenshot, a new feature introduced for career mode is engine and gearbox management. It’s something that you have to really think about. Do you want to introduce a new part? Do you want to take a penalty at a track you’re not competitive on to have fresh engines at a competitive track? Overall, it’s fair to say to say Codemasters have delivered a massive improvement from 2016. Expanding career mode and including classics in different game modes is something you can spend hours on. 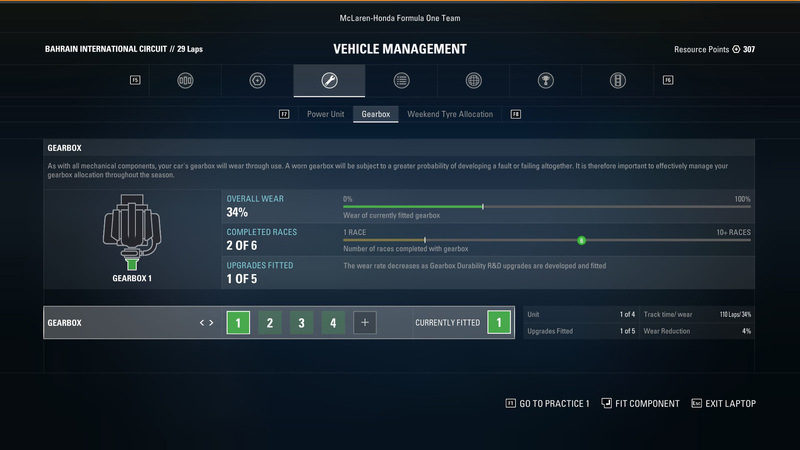 Indeed, the new championship modes allow you to drive modern or classic cars with different rules. There’s a double-header weekend, similar to GP3 or F2. There’s also a sprint championship, and a ‘classic’ championship. This allows you to drive various classic cars using classic tracks, on a points system that only pays for the top six positions. Previous How will the second half of the 2017 Formula 1 season pan out? Think you know your obscure F1 drivers? A simple quiz, you get a name, you try and figure out if it is a British racing driver, a British village, or both.